“The Mill and the Cross” is perhaps best a vehicle for the imagination, a diversionary exploration of art, a technological achievement of escapist joy – even as much as it bastardizes the very notion of plot, story and character. Which is why it must be experienced first hand, up close and personal with the best audio-video equipment possible because watching this film on a tablet computer or elsewhere offensively small would be like going to Vegas to see the pyramids of Venetia and the Paris of New York forever immortalized in your cocktail napkin collection. Sufficient for grandeur indeed, the effects are striking enough to root you there in lofty nothingness, showcasing a perfect marriage of creativity and science, granting new dimensions where vast dimensions have been, suggesting new avenues and improved ones. Watching as camera and canvas become one, seeing painted backdrops, computer effects and staged designs melding to form history and revisionist dreams is like finally seeing the three-dimensional reality of places you’ve been or even just imagined in a completely new way. Yet we are lead to believe in the medium that story is the guiding force of narrative, drama the through line of story and in the absence of such necessity, movies aren’t movies they are something else – documents of something, history lessons and examples to make points convincing. 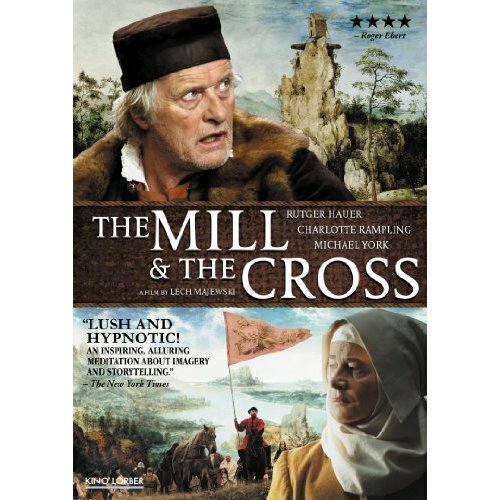 In this case, “The Mill and the Cross” fails terribly at story – so don’t see it for that, see it for the aforementioned. There are no lasting impressions of characters to connect with, no sense of place or repeatable challenges, only rewards and punishments of the moment. This is where the film steers to trouble waters, consumed with getting the art right without the structure, setting audiences apart, separated by those easily caught up in the moment and those needing more, demanding substance over clever, plot and story instead of so much iconography and symbolism. You can cater to separate crowds but not successfully. It doesn’t take away from the art, this void of story, but go it alone and troubles sprout like unquestionable fires of scrutiny. Watching the intricacies of a great painting finally coming to life is as fantastic as it sounds and even twice as rewarding but it’s hard to build a film around. Concepts and gimmicks can wear thin at times and show through completely, returning again to our willingness to put such things into consideration or fail trying. The fact that great art is hardly lasting in any state, and a film filled with paintings brought together using imaginative measures alone that live strong in the moment but inevitably fade, replaced just by more images, begins to reveal the greatest weakness of all art films – this one it shattering detail. This is not to say all films must be the same but it is clearly a dividing line between those with story and those without and clearly “The Mill and the Cross” leaves story up to the beholder. Just as one must see this film to fully enjoy it one must accept the fact that story is absent, not missing, not done wrongly but never present and structure is the least common thread. You don’t have to like art to want to like art more, or truly appreciate art to think one way or the other about a film about experiences. There is however, stiff competition these days with all the comic book heroes and historical fiction, dramatized truth and Oscar contenders as sleepy song and dance numbers make perfect pitches and elevator testimonials marketable – and films by, for and about art are relegated to dusty shelves and quirky labels even that much farther away. The result is something akin to passing time, content while it is happening but a poor measure of the 97 minute investment, hardly convincing the imagination is trustworthy let loosed, however much it fuels questions that do not require answers or meaningfulness often better when merely experienced – even when discussed in movie reviews. Like all great art, what to make of it is up to you and how you spend your time convincing yourself of how it makes you feel can only fully be understood in terms of your personal relationship to it. Perhaps you’re better at such decisions and therefore this will make much more sense and better armed you’ll find plenty of both worlds to satisfy – or not. Polish filmmaker and video artist Lech Majewski, who co-wrote the screenplay with art critic Michael Francis Gibson (adapted from his book), is primarily interested in personal revelation as an extension of our shared experiences of art and however much we enjoy the fleeting moments we’re left wanting more, finally. 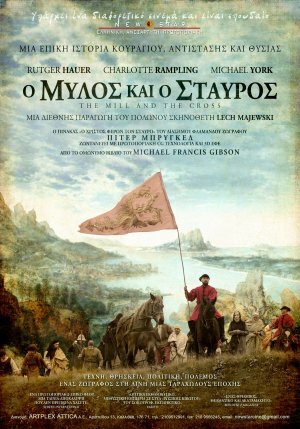 As social and political commentary, Majewski’s use of Bruegel’s fascination with 16th century Antwerp (the era, not necessarily the geography) seems the perfect landscape for discovery and conversation even as it makes us uncomfortable – the sign of all art or should be. 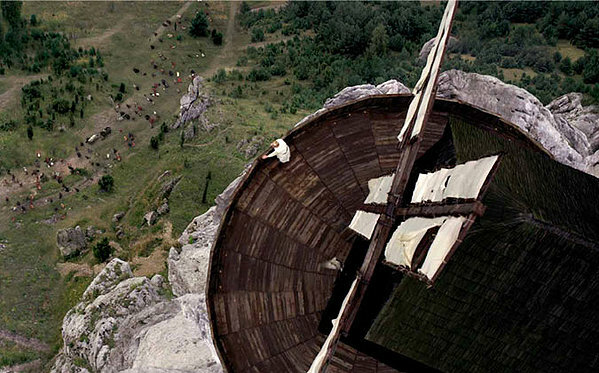 But Majewski does not make it easy, especially the way all these conditions and ideas are jumbled together, one on top of one another fueling whole new shapes and sizes without focus or purpose – and that is when we finally arrive at some kind of conclusion with the artist speaking to the artist. If it all seems more like random has won the war of purpose and we’re left to our own devices, it’s possible to own something so intangible, to embrace it and leave uncertain, inspired and pleased with getting the powerful state of being in the moment, ready to receive art. Perhaps in the end, caught up in our own demise, we can accept the role of flagman of stress and applied sciences and spend too much time signaling disasters that seem to come in waves and then not at all, finding us and leaving us as amid disasters sometimes reflected in movies about art and art in general, unconditionally waiting there in the certainty of yesterday. This entry was posted in Essays on art, Essays on Film, Movie I've Seen, My Review of Their Review:, On DVD, philosophy and film, Rants & Raves, Speak-Freely and tagged 16th century, 2011 films, above the line, ann rambpling, art, art film drama film, Charlotte Rampling, flagman of stress and applied sciences, flanders, flemish painting, Lech Majewski, Michael Francis Gibson, Michael York, pieter bruegel, Pieter Bruegel the Elder, practical movie reviews, rory dean, Rutger Hauer, the mill and the cross, unquestionable fires of scrutiny. Bookmark the permalink. I like this film for all the reasons you don’t but I appreciate your reasons. You have such a poeticism in your lines that both appeal and lose your meaning, however delightful. This paragraph is my fav ” If it all seems more like random has won the war of purpose and we’re left to our own devices, it’s possible to own something so intangible, to embrace it and leave uncertain, inspired and pleased with getting the powerful state of being in the moment, ready to receive art. Perhaps in the end, caught up in our own demise, we can accept the role of flagman of stress and applied sciences and spend too much time signaling disasters that seem to come in waves and then not at all, finding us and leaving us as amid disasters sometimes reflected in movies about art and art in general, unconditionally waiting there in the certainty of yesterday. Thanks Lilian – You are always kind and heartfelt when you write to me. I appreciate your candor, you reserve and your forthrightness. I began many moons ago in words and scribbled verse poems, in scattered ideas and abreviated sentiments about my experiences and adventures, about people and places and things I knew or wanted to. My life has been an interesting series of squares and rectangles. Who and what or why is entirely possible and almost certainly unknowable.